HK Wax Center – Austin Arbor wants our clients to have the best brazilian waxing experience possible. A lot of companies will forget the most important part of aftercare for a brazilian or bikini wax: skin care! The products you use after a wax can greatly affect your results. So, we went out and found the best brazilian waxing post care product out there to ensure you keep coming back time and time again! Skin care products work wonders when you use the correct ones after a bikini waxing appointment. Your hair will start to change after you continuously get waxed. The hair will become softer and finer since it is being pulled from the root each time. This means it might have a harder time pushing through the skin which results in an ingrown hair. However, you can help prevent this from happening! AKA, this is when skin care products come into play! Certain acids and ingredients can assist ingrowns and blemishes from ever being a problem for you. But not all products are supposed to be used on your bikini area. So make sure to talk to your Esthetician before using a product to make sure all the ingredients are safe. Glycolic Acid: Glycolic Acid is the holy grail for exfoliation. It will remove the outermost layer of dead skin cells to reveal smoother, younger skin. Made up of small molecules, glycolic acid can easily penetrate the skin and is very affective for ingrown hairs. Salicylic Acid: Salicylic Acid is one of acne’s biggest antagonists. The acid will help dissolve the type of debris that clogs pores and causes acne. It also aides in drying out and loosening the pore to help regulate skin cell turnover. Lactic Acid: Lactic Acid is a larger molecule which hydrates the skin. It will stimulate collagen production and encourage the outermost layer of skin to shed quicker. This will help cell turnover to reveal softer skin and prevent the natural oils from escaping. PFB Vanish is best if used after a shower when the pores are warm and open. This makes it easier for the serum to seep into the skin. 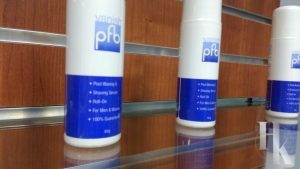 You can also spot treatment with PFB Vanish if an ingrown or blemish is being more stubborn than normal. It also contains antibacterial ingredients which help keep bacteria and infection away. We truly believe this product is the best post waxing skin care for all hair removal options, not just waxing! For more tips to getting a perfect brazilian wax, click here.